Subject: Rock Climbing the Gunks! Hello troop. It’s adventure time! Do we have any good climbers out there? I am organizing a trip to the Shawangunk Ridge in New Paltz NY. The "Gunks" are located in the Mohonk preserve. 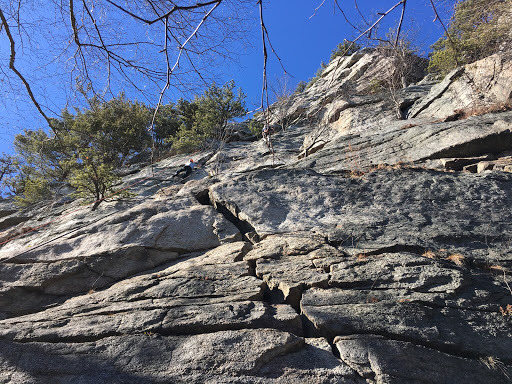 Mohonk is well known as a beautiful area to go on vacation,however the area also happens to have excellent climbing. The Gunks are actually world renowned for the hundreds of interesting climbs concentrated in a small area. All this and the Gunks are located right around the corner! Aren’t we lucky? The Climb will conducted by Alpine Endeavors. A great guide service that REI (the camping equipment store) use to host their events. I went two weekends back on what was supposed to be an ice climb that turned into a rock climb as we had T shirts on. The climb was professionally run, very well organized, and incredibly fun. When? Saturday April 15. We will leave around 6.00am and be back around 7.30pm. All climbing equipment will be provided as part of the fee. Helmet, harness, shoes etc. The climb is open to all ages. Cost- depending on how many people we get it will be $130 to $150 per person for the climb. we will need to cap the group to about 20 participants. First come first served. Don’t worry its reasonably safe. Just as safe as skiing, rolling skating, or any other active sport. The climbers are tied to the mountain and have all the necessary safety gear. As long as the safety rules are followed its an exciting, but safe sport. Now I’m not going to lie to you, its SCARY to be 200 feet up on a cliff holding on with your fingertips and toes! But its a great bonding experience for the group and an experience you will never forget. As the boys develop their skills in the troop, I would like to see them gain these adventure experiences generating memories that will last a lifetime. The picture below is of me climbing two weeks ago. It gives you an idea of what you are in for. Also attached is the merit badge pamphlet if you are interested in gaining credit for the experience. I will make sure everyone who wants the badge has every opportunity to get it. We will practice many knots and rope handling skills before the trip. Please click this link to sign up and find out more about the day. Lots of cool discounts are available in this link too. I will review the plan and show some of the gear we will use during the meeting on Wednesday.